Children's Health (Pictures 1-8) - Do Physical Exercise. Get the BCG Inoculation. Don’t Spit Anywhere. Love Cleanliness and Sanitation. "In the 20th century, under both Nationalist and Communist governments, China supported public health measures as a way to strengthen the country. The state promoted preventative health, and children were a particular concern for both the health and the education ministries. The children’s health material promoted exercise, vaccination, controlling spitting, keeping utensils clean, and honest behavior." 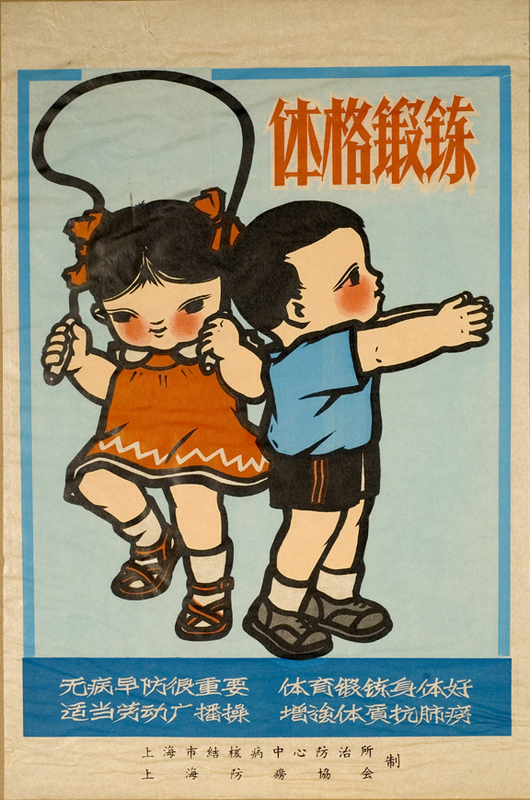 Family Planning (Pictures 9-14) - Beginning in the 1970s, China strongly promoted policies of limiting fertility, using the slogan "wan, xi, shao" – 晚 稀 少 – "later,longer, fewer." 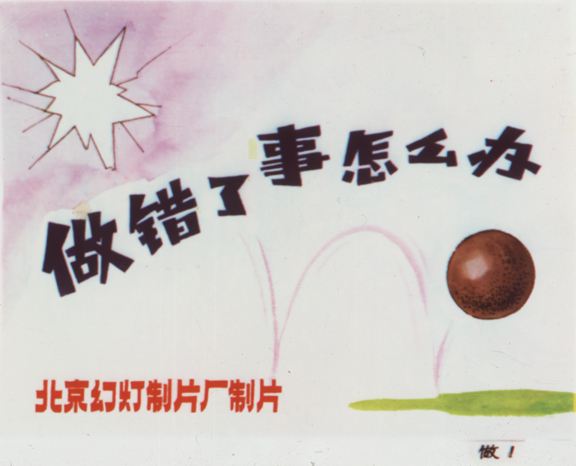 Medical Advertisements (Pictures 16-19) - "The Tianjin Pharmaceutical Factory, founded in 1921, used western methods to produce and market traditional Chinese medicines. The sheets shown here advertise a mix of European and Asian products, using ideal feminine and masculine images as well as the Tian An Men (Gate of Heavenly Peace). Ads for progesterone and methyltestosterone show the appeal of potent over-the-counter hormone therapies." The Four Pests (Pictures 20-21) - "Beginning in the 1950s, the Chinese state mounted the Patriotic Health Campaigns to improve sanitation and public health. In 1958 the campaigns focused on the "the four pests": rats, sparrows, flies and mosquitoes." What to do about one's mistakes (Cycle through 12 consecutive frames) - This series of transparencies teaches children how to admit their mistakes and correct wrong behavior. An energetic little boy is playing with a ball and accidentally breaks a window. Classmates and their teacher think another child is the perpetrator, until the boy admits his mistake. An understanding between teacher and playmates contributes to a happy ending.